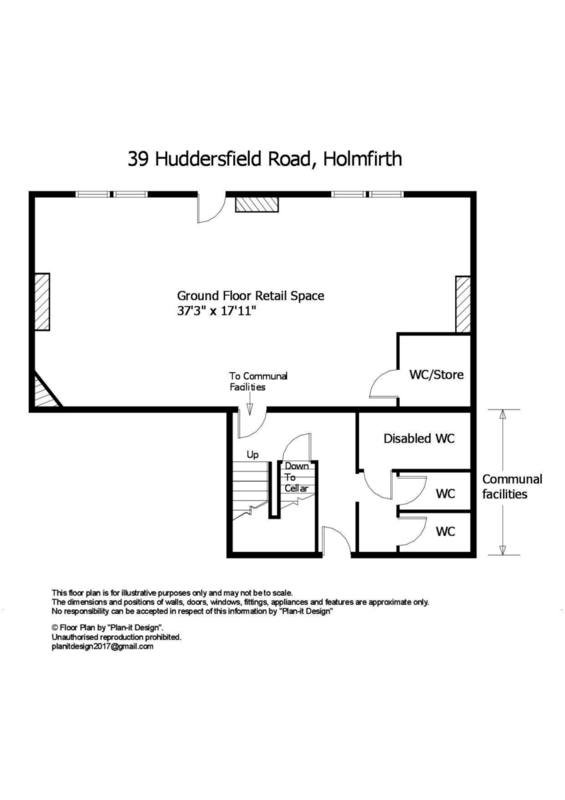 A large double fronted shop / office unit, located in the centre of Holmfirth. It features large picture windows to either side of a central entrance door. It features inset spotlighting and central heating radiators. It is open plan throughout with the exception of a small store room located in the corner which has plumbing for a customer WC. The suite also has use of the communal staff WCs at the rear of the building. There is also the added benefit of a small garden area to the front. A service charge levy of £2.50 per square of the rental will be made to each tenant Â– this covers, heating, cleaning of communal areas, window cleaning, outside repairs and maintenance. Any surplus will be refunded to the tenant. Each suite is independently metered for electricity usage and the tenant will be responsible for their own usage. The tenant will also be responsible for business rates Â– we advise small business tenants to investigate whether they would qualify for small business rates relief.